Alsco has a state of the art facility in Palmerston North, New Zealand. This facility provides a higher quality and more efficient service to customers as well as offering a range of environmental benefits. After months of careful planning, preparation and construction, Alsco’s state of the art commercial laundry in Palmerston North opened in February 2012, to service businesses across New Zealand’s lower North Island. Construction began on the purpose-built Hub in April of the previous year, with building work completed in late October. “The building from ground up took ten months, including the majority of the equipment fit-out prior to the move. The project involved a combination of contractors and our own engineers,” explained Palmerston North Branch Manager Kurt Petherbridge. “The transition of staff from the Donnington St Palmerston North plant to the new premises in Mihaere Drive went very smoothly,” said Kurt. “Half moved on February 13 while the other half moved on February 20.” “Everyone loves the new building with its modern facilities and they are very enthusiastic as we settle down the workings of the new equipment,” said Kurt. Enhanced natural lighting, energy efficient systems that utilise heat recovery, specialised roof insulations and central ventilation systems. Water consumption reduced by nearly 40 per cent. Gas consumption reduced by the purpose built hot water generator. A trade waste system that incorporates two separate treatment systems, which will reduce the risk to the environment. Heat will be recovered from water discharge and used to pre-heat incoming water. Electricity demand will reduce due to the use of modern efficient equipment. Benefit from the profession, hassle-free, efficient Alsco managed Linen Service. 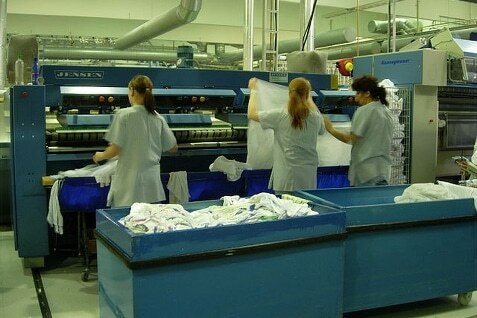 Linen laundered in an environmentally-friendly plant, delivered to you by friendly service representatives. For details and a free quote, get in touch with Alsco now.